Perhaps it is fitting to choose a piece for today based on music that comes from an opera about a love triangle. (Please see my article below about visiting Barcelona in 1977.) Composed in 1883, eight years after Carmen’s disastrous premier and after its revival in Paris, the Fantaisie. is one of those pieces designed to show off virtuoso violin playing. It is full of incredibly high, almost ethereal harmonics and complicated double stops that almost chill you to the bone. Then there are the devilishly fast passages with bouncing bows and rapid pizzicatos that seem capable of generating sparks. The main reason I wanted to visit Barcelona in April of 1977 was to see first-hand the works of the Art Nouveau architect, Antonio Gaudí. His surrealistic buildings captivated me the first time I came upon them in an art history book in college. Gaudí’s work seemed to be a last reaction against the straight lines and harsh angles of the cold machine age. Gaudí on the other hand, incorporated organic and naturalistic shapes into his buildings, some of which looked as if they were melting, others as if they would start sprouting tendrils. Gaudí was able to bring his visionary design to light because of a wealthy patron name Guell, and created for him a palatial dwelling, a public park, and several apartment buildings. Indeed, Gaudí’s presence is such an integral part of Barcelona that had he not lived, I am sure it would not have given us the likes of Picasso, Dali, and Miro. So, on our excursions out, I dragged my traveling companions, Inge and Chris, to various parts of the city where Gaudí had created his fantastic buildings and public spaces. My first goal was to locate the Casa Mila, an apartment building that has an undulating, organic façade and looks kind of like a big, bloated puff-ball mushroom. It appears in a number of art history books, and it had shown up in a film by Michelangelo Antonioni called “The Passenger” which I had seen the year before. In one scene in the film, Jack Nicholson and Maria Schneider go onto the roof, which has white, surrealistic chimneys decorated with brightly colored stones and tiles. I wanted to see if we could do the same. We found the Casa Mila in a fairly nice part of town. It is in the shape of the letter “L” and we ducked into the bottom of the short leg into the main courtyard just as it started to rain. This courtyard had been covered over and the misguided owners had carved up the interior space in an attempt to create a number of little trendy boutiques, but which were quite hideous. One was full of late 1970’s disco gear and I seem to remembers a silver mannequin with a black afro wig, 6-inch platform shoes, a blue cape and a black feather boa. We eventually found a long sweeping stairway that followed the interior wall of the courtyard up to the next level. I looked up and saw that Gaudí had covered the ceiling with wild and colorful frescoes. Unfortunately, they hadn’t been maintained and they were now flaking and peelings. They could have been “The Last Supper” for all you could tell. I wondered what the hell the condo association was spending its money on if not the upkeep of the building. We took an elevator to the top floor and emerged, completely amazed at what we saw–there didn’t seem to be a single straight line in the place. The wall curved gently around the inner courtyard and the floors and door frames were all made of a lovely, honey-colored wood. The walls were creamy stucco. We wondered around the floor passing a number of locked doors. Eventually we found ourselves back where we started but there was a change: one of the doors that had been closed was now open. I pushed it open a little further and looked in. It was dark but when my eyes adjusted, I saw it was a stairwell leading upward. I stuck my head in and a drop of water struck my forehead. I looked up and saw these ghostly shapes suspended above me. They were sheets. It was wash day, and because it was raining, someone had hung their laundry in the stairwell because they couldn?t put it up on the roof. I persuaded Chris and Inge to follow me, and we emerged onto the roof. It was grand! It looked like Gaudí had sculpted the rooftop out of meringue. He had created a tiled walkway that leads around the outside of the L-shaped building. This walkway went up and down like a huge roller coaster. The walls were white and inlaid with colored glass and semi-precious stone and Gaudi had built a continuous low bench into the wall that ran round the perimeter. Though it was blowing rain, we felt like kids in a giant playground and we peered over the walls looking for various landmarks. We spotted Gaudí ‘s church, La Sagrada Familia, in the distance, his Parque Guell, the port and the Luna Park to the south. After coming down to the street, we ducking into a bar/restaurant and ordered a tortilla and my usual Campari and soda. At the bar, I notices they sold cigars and when I went up to investigate realized they were Cuban. I asked the barrista what they called them and she said “puros.” I bought one of these fat, thick stogies and lit it up, much to the disgust of Inge and Chris. Inge announced that she was going to leave for Majorca in a day or two and Chris and I looked each other. Back in Paris, I had tried to form a romantic relationship with this dour, self-abusing, German existentialist. We had long deep discussions and part of me thought she might be my soul mate. Then Chris, the free spirit from California, came along and they instantly bonded. Chris and I were staying in Shakespeare and Company and we all hung out together, so I was invited along to Barcelona, though I felt a bit of a fifth wheel. Now Inge was announcing that she was off to Majorca and she did not invite either of us along. 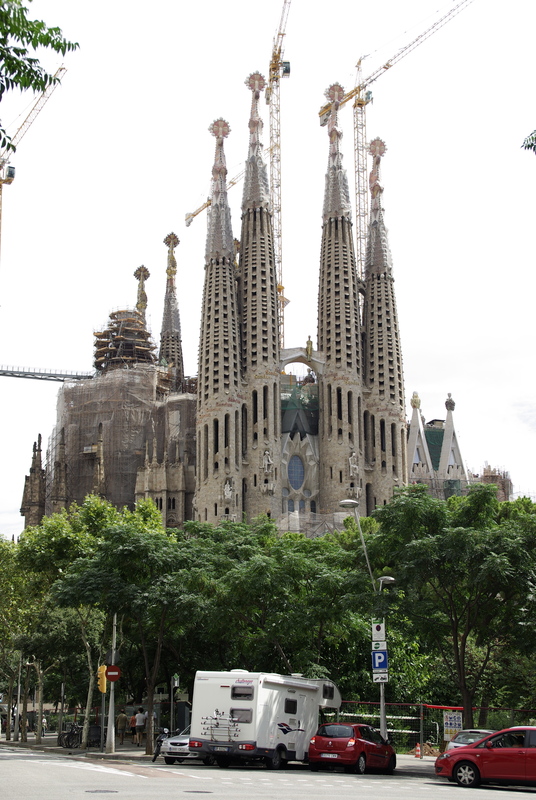 After lunch it stopped raining and we continued on our way in search of the next Gaudí building. As we walked, I puffed my puro pensively and looked at the buildings, the streets and the sidewalks, trying to get a feel for the city. Suddenly a pattern in the sidewalk caught my attention. I looked carefully and realized the sidewalk was made up of molded tiles with an intricate, interlocking pattern. They reminded me a bit of those morphing tile patterns of M. C. Escher, in which black birds flying one way interlock with white birds flying in the opposite direction. When I pointed this out to Chris and Inge, the latter said that she had read in her guide book that Gaudí had designed these tiles as well. Seeing these tiles tickled me. First, because I liked the idea that Gaudi had been able to turn his ideas into reality and change the physical environment around him to fit his visionary dreams. Second, these tiles represented a connection with Spain’s Moorish past. Islam is an iconoclastic religion and artistic representations of people were forbidden. Artists therefore turned their talents filling spaces with visually interesting organic forms and curlicues. Eventually these became more and more abstract and became into repeating tile patterns that covered unused space. Think of the Blue Mosque or Arabic calligraphy. 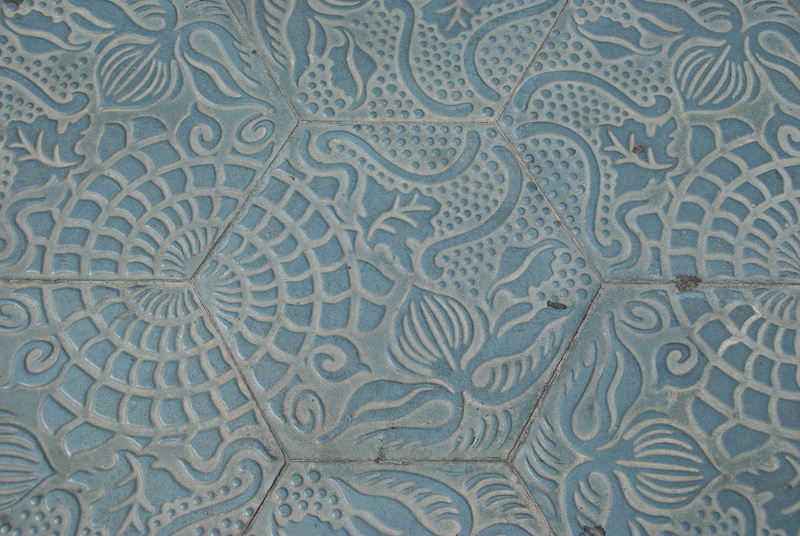 The Moors had conquered Spain and brought their artistic traditions with them, which showed up in these tiles of Gaudí. 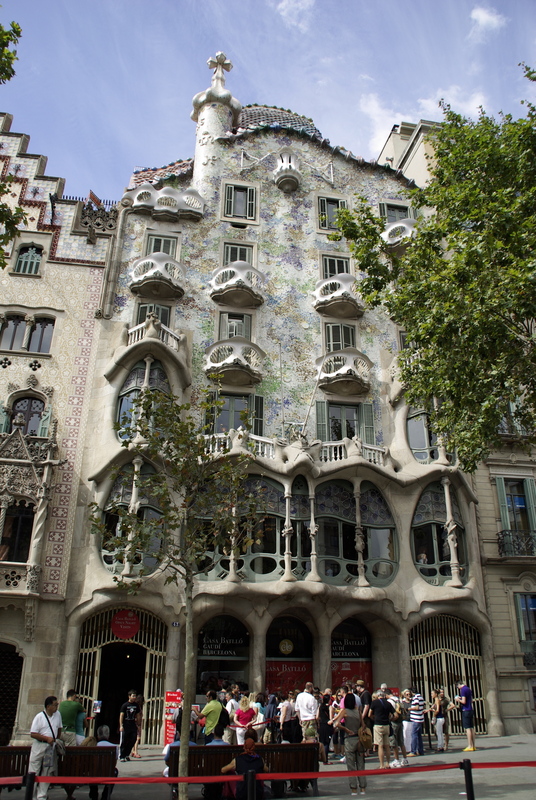 Eventually, we found Gaudí’s Casa Batlló, the roof of which he designed in the shape of a giant multi-colored dragon. It has the most wonderful facade, the apex of Art Nouveau. 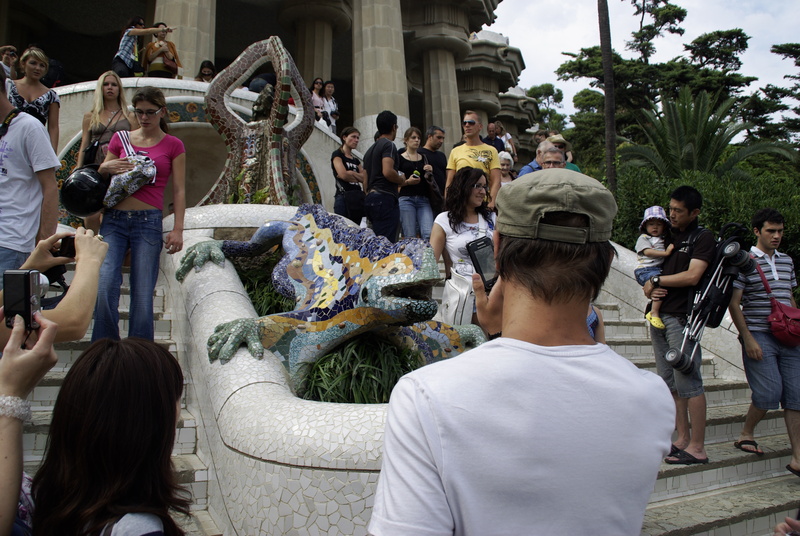 Later we went to the Parque Guell, which has two cascading stairways, between which Gaudí created a fantastic, dragon-shaped fountain that crawls down the hill and belches water to greet the visitors as they enter the park. These works show how the freer Gaudí became to do what he wanted the more organic and fantastic his works became. He became so engrossed by his work that he turned into a long-haired hermit, who often slept in a shack on the building sites for his structures. A day or two later, Chris and I woke early and met Inge, whom we escorted to the port and the ferry that took her to Majorca. Afterwards, Chris and I sat around planning what to do next. He decided to go south to Valencia and me back to Paris. Palm Sunday was coming in a few days, however, and I persuaded him to remain so we could see a few of the spectacles leading up to Easter, and so we spent the next few days exploring the city, eventually becoming friends and trying to deconstruct what had happened between us and Inge. But more on that later. Perhaps it is fitting to choose a piece for today based on music that comes from an opera about a love triangle. (Please see my article below about visiting Barcelona in 1977.) Composed in 1883, eight years after Carmen’s disastrous premier and after its revival in Paris, the Fantaisie... is one of those pieces designed to show off virtuoso violin playing. It is full of incredibly high, almost ethereal harmonics and complicated double stops that almost chill you to the bone. Then there are the devilishly fast passages with bouncing bows and rapid pizzicatos that seem capable of generating sparks. Gaudi’s Gaudy Architecture The main reason I wanted to visit Barcelona in April of 1977 was to see first-hand the works of the Art Nouveau architect, Antonio Gaudí. His surrealistic buildings captivated me the first time I came upon them in an art history book in college. Gaudí’s work seemed to be a last reaction against the straight lines and harsh angles of the cold machine age. Gaudí on the other hand, incorporated organic and naturalistic shapes into his buildings, some of which looked as if they were melting, others as if they would start sprouting tendrils. Gaudí was able to bring his visionary design to light because of a wealthy patron name Guell, and created for him a palatial dwelling, a public park, and several apartment buildings. Indeed, Gaudí’s presence is such an integral part of Barcelona that had he not lived, I am sure it would not have given us the likes of Picasso, Dali, and Miro. So, on our excursions out, I dragged my traveling companions, Inge and Chris, to various parts of the city where Gaudí had created his fantastic buildings and public spaces. My first goal was to locate the Casa Mila, an apartment building that has an undulating, organic façade and looks kind of like a big, bloated puff-ball mushroom. It appears in a number of art history books, and it had shown up in a film by Michelangelo Antonioni called “The Passenger” which I had seen the year before. In one scene in the film, Jack Nicholson and Maria Schneider go onto the roof, which has white, surrealistic chimneys decorated with brightly colored stones and tiles. I wanted to see if we could do the same. We found the Casa Mila in a fairly nice part of town. It is in the shape of the letter “L” and we ducked into the bottom of the short leg into the main courtyard just as it started to rain. This courtyard had been covered over and the misguided owners had carved up the interior space in an attempt to create a number of little trendy boutiques, but which were quite hideous. One was full of late 1970’s disco gear and I seem to remembers a silver mannequin with a black afro wig, 6-inch platform shoes, a blue cape and a black feather boa. We eventually found a long sweeping stairway that followed the interior wall of the courtyard up to the next level. I looked up and saw that Gaudí had covered the ceiling with wild and colorful frescoes. Unfortunately, they hadn’t been maintained and they were now flaking and peelings. They could have been “The Last Supper” for all you could tell. I wondered what the hell the condo association was spending its money on if not the upkeep of the building. We took an elevator to the top floor and emerged, completely amazed at what we saw–there didn’t seem to be a single straight line in the place. The wall curved gently around the inner courtyard and the floors and door frames were all made of a lovely, honey-colored wood. The walls were creamy stucco. We wondered around the floor passing a number of locked doors. Eventually we found ourselves back where we started but there was a change: one of the doors that had been closed was now open. I pushed it open a little further and looked in. It was dark but when my eyes adjusted, I saw it was a stairwell leading upward. I stuck my head in and a drop of water struck my forehead. I looked up and saw these ghostly shapes suspended above me. They were sheets. It was wash day, and because it was raining, someone had hung their laundry in the stairwell because they couldn?t put it up on the roof. I persuaded Chris and Inge to follow me, and we emerged onto the roof. It was grand! It looked like Gaudí had sculpted the rooftop out of meringue. He had created a tiled walkway that leads around the outside of the L-shaped building. This walkway went up and down like a huge roller coaster. The walls were white and inlaid with colored glass and semi-precious stone and Gaudi had built a continuous low bench into the wall that ran round the perimeter. Though it was blowing rain, we felt like kids in a giant playground and we peered over the walls looking for various landmarks. We spotted Gaudí ‘s church, La Sagrada Familia, in the distance, his Parque Guell, the port and the Luna Park to the south.